Immerse Yourself in Crystal Light. A Crystal Light Bed session creates an opportunity to take time out, surrender mundane thoughts, and receive. It is a relaxing, rejuvenating, repairing and rebalancing experience which can strengthen awareness, connection to the divine, and aid transformation. 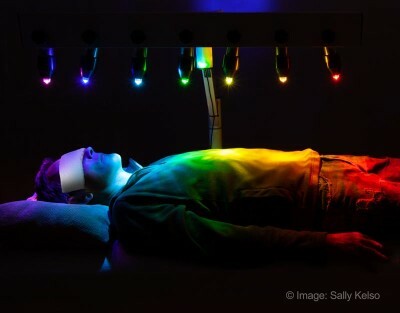 The physical and the etheric bodies are immersed in coloured light during the treatment. The rhythm of the lights, combined with beautiful relaxation music, makes it easy to surrender to this beautiful experience. The Crystal Light Bed has seven extremely clear and highly polished Vogel cut quartz crystals that are suspended above a treatment table. Each crystal has been cut to a specific frequency and is positioned to align with and correspond to the 7 major chakras of the human body. Coloured lights, chosen to match the frequency of the chakra colours, radiate light and energy through the crystals to the respective chakras to cleanse them and balance their energies. A session consists of laying, fully clothed, under the lights on a comfortable treatment table with the eyes closed. Soothing music is played throughout the treatment. You can choose a 30 Minute or 60 Minute Crystal Light Bed session. It is better to wear loose, comfortable clothing, ideally white or light in colour. You will be required to remove your shoes, and any belts or eye glasses whilst you are on the Crystal Light Bed. It is also recommended that you do not wear any jewellery or crystals during the treatment. You are invited to have an intention for the session or to silently say an opening prayer or affirmation. The experience can range from a calming and relaxing session to a life altering healing experience, particularly as one becomes aware of a palpable energetic connection with the Divine. Most people who have experienced a Crystal Light Bed Therapy session report a sense of feeling lighter and more energised.